Gear is a mechanical part that can fit into each other, and the gear transmission can complete deceleration, speedup, change direction and other functions. It is widely used in mechanical transmission and mechanical field. The manufacturing precision of the gear itself has great influence on the working performance, bearing capacity and service life of the whole machine. 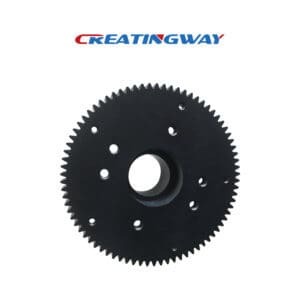 Creatingway manufactured different kinds of gear parts, metal material, plastic material, etc. for various using purpose, We will take this article to share more machining process on gear parts manufacturing. Generally, gears are selected with medium carbon steel (such as #45 steel) and low, medium carbon alloy steel, such as 20Cr, 40Cr, 20CrMnTi, etc. And 38CrMoAlA nitriding steel can be selected for the higher required important gear parts. Also, sometime, we have machined the gears with stainless material. There are also plastic gears. Plastic gears are more lubricity and abrasion resistance. It can reduce noise, reduce cost and reduce friction. The plastic material of gear will be more smooth than metal gear, such pom, nylon as the material itself have unctuosity performance. So we will further suggest to use POM material. The common used plastic gear materials are PVC, POM, PTFE, PA, PEEK, etc. Pre-heat treatment is arranged before and after the processing of gear blanks machining, the main purpose is to eliminate residual stress caused by forging and rough machining, improve the machinability of material and comprehensive mechanical properties. After finish gear shapes，In order to improve the hardness and abrasion resistance of the gear surface, the heat treatment processes such as carburizing, quenching, high-frequency induction quenching, carbonitriding and nitriding, etc. Contact Creatingway and send the inquiry to us of you have gear parts need the sample or batches production. We have rich experience on these metal and plastic cnc machining on different industry, provide you 2nd finishing services, make best partner to you. We will share these gear parts CNC machining process next article included machining method, standard, facilities etc.